Less than two free android cell phone spy weeks ago, Quinceanera.com and the Department of Children and Family Services of Los Angeles (DCFS) had a wonderful celebration for eight Latina girls from the foster care system. The cell phone spy app celebration included shiny dresses, accessories, bouquets, entertainment, a delicious feast for 300 people, and much more. But above all this, there was the happiness felt by the young girls and their cell phone spy software how to detect families who were aware of the efforts made to make a dream party come true. Today, the joy has continued through to the meeting room of the Los Angeles County Board of Supervisors. It came with a very special recognition for the multimedia company Quinceanera.com by Supervisor Hilda L. Solis, who was impressed by the event and the number of companies, more than 40, that donated their products and services to such a good cause. “During the past two years, Quinceanera.com has recruited a lot of vendors committed to making this celebration for our foster youth indeed very special,” said Supervisor Solis. 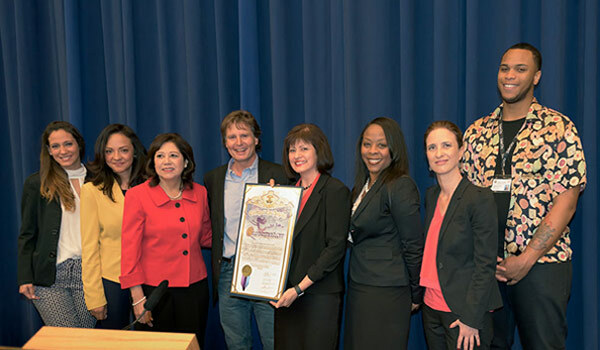 “So today we acknowledge Quinceanera.com, especially their co-founders Martha de la Torre and Joe Badame, for their commitment in giving the Los Angeles County’s foster youth the opportunity to experience this important rite of passage. Even more important for girls that have suffered significant loses, often at a very young age, who are deserving this special recognition. We are very, very pleased to have you all here.” The praise was greatly appreciated by Martha de la Torre, also owner and cofounder of El Clasificado and EC Hispanic Media, who did not hesitate to thank Los Angeles County for everything that has been given to her and her family. “My father immigrated to the United States in 1964 with 17 dollars, and eventually worked for the County,” said de la Torre. “Thanks to his effort and the opportunities provided by the County, I was able to study in Loyola, go to Ernst & Young, meet my husband and consequently, become entrepreneurs.” De la Torre also stressed the importance pay for writing an essay of celebrating a quinceañera for Latina girls: “In some cases, it is even more important than a wedding.” She also took the opportunity to express her wishes for the young girls. “I hope this event, in addition to bringing their family together online plagiarism program and making the girls feel like princesses, is the beginning of their lives toward becoming great citizens of Los Angeles County.” Philip Browning, Director of Los Angeles County Department of Children and Family Services, did not want to miss the recognition of Quinceanera.com and thanked the Board of Supervisors for such a moving tribute. “The eight quinceañeras will remember this day for spy hacker phone the rest of their lives, so I would like to invite everyone here to next year’s event so you too can feel the love we show to all of these young women.” The second edition of the special event for the quinceañeras from foster care was held on March 12 at LA Plaza de Cultura y Artes and was made possible by Quinceanera.com, the Department of Children and Family Services of Los Angeles (DCFS), and donations from more than 40 altruistic companies. To read the original story at EC Hispanic Media, please click here.